It's true! No type of carpet cleaner is more accurate than Swedry®. Whether you have a 1-800 DRYCARPET™ professional clean your carpet or choose to do it yourself, our carpet cleaner is one of the smartest, simplest home improvements you can make. Depending on the product assortment that you select, you can save up to 33% on future carpet cleaning costs. This kit is not intended to enable you to clean your entire home. It is used for area rugs and to remove individual spots and/or detergent residue from carpet. 1. Vacuum area to be cleaned. 2. Pre-clean / remove stains. 3. Apply dry carpet cleaner. 4. Brush with approved brush. 5. Vacuum / remove dry carpet cleaner. Vacuum area to be cleaned. Change vacuum bag if necessary. Use ACCELERATOR™ to remove difficult stains such as; ink, red dyes, petroleum or grease. Follow directions on label or read them now. How much product to apply depends on prevailing soil conditions. One canister of Swedry® Carpet Cleaner will clean 25-75 square feet. Brush Swedry® Carpet Cleaner in several directions. Overlap and intersect your brush strokes. Brush in a north-south direction and then a east-west direction. Important. Re-apply and re-brush Swedry® Carpet Cleaner in abused or detergent residue areas. Swedry® Carpet Cleaner removes detergent residue left in carpet by steam cleaning services, household spot removers or rental cleaning units. Allow Swedry® Carpet Cleaner to dry (2-3 minutes) before vacuuming. Swedry® Carpet Cleaner cannot clog any type of vacuum cleaner. Swedry® Carpet Cleaner brightens color ... restores luster ... helps rugs wear better ... stay clean longer! At the office? 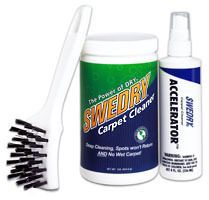 : It is okay to leave Swedry® Carpet Cleaner in your carpet for several hours or several days! Swedry® Carpet Cleaner is not harmful and will continue to absorb any new soil for 3 days. You may walk on Swedry® Carpet Cleaner if you'd like. As a company, 1-800 DRYCARPET™ is one of four in the world that manufactures an authentic dry carpet cleaning powder-product. That's why we can declare, "We're different; We're 1-800 DRYCARPET™ ". If you are bothered by spots mysteriously reappearing after using liquid household carpet cleaning products you've come to the right place. 1-800 DRYCARPET™ Carpet Cleaning is a division of America's Preferred, Inc. All rights reserved ©1997 - 2004 America's Preferred, Inc.